ColorShift LED Halo Rings by Oracle Lighting are taking the automotive aftermarket by storm. Installing an Oracle LED Halo Light Kit on your vehicle will instantly change the entire appearance of your vehicle, especially at night. 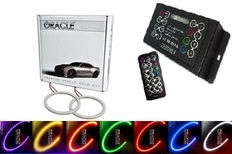 Oracle Halo Kits are of top quality and no Inverter is required. Connect directly to 12V Source, such as your parking lights, for automatic operation or wire them to a switch for manual control. Oracle LED Halo Light Kits use a rigid PCB lined with top quality leds. LED Halo Kits shine directionally forward and are not prone to the same breakage risks older style glass halo rings are susceptible to. You'll notice as soon as you receive your rings that there are no gaps in between the LEDs unlike some of the generic knock offs popping up in the marketplace. Oracle LED Halo Rings have an industrial grade self adhesive backing that will hold them in place with ease. Oracle is so confident in the performance of these halo kits that they come with a Lifetime Warranty. 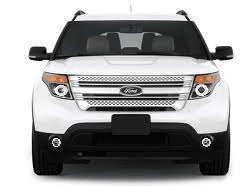 This LED Halo Light Kit fits 2012-2014 Ford Explorer models and comes with the halo rings for both headlights. Professional installation is strongly recommended. Please have your mechanic quote you a price prior to purchasing these lights, as many mechanics do not have an oven in their facility and will not be able to do the job. If planning to install these yourself, please watch the install video to make sure you are comfortable with the process of baking your existing headlight to melt the adhesive holding it together and then prying it open before purchasing.